This beautiful formal garden features a grassy area. During the summer months it is surrounded with a colorful border of flowers. 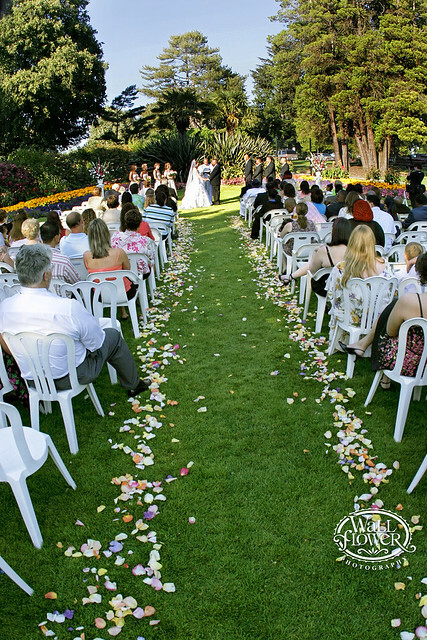 It is located between the Lodge and the Rose Garden Gazebo and provides a beautiful setting for weddings & ceremonies. Sits amidst a formal rose garden setting. The Gazebo holds 30-50 people (standing). Please remember that your facility rental is for the Lawn or Gazebo only. The rental client and MPT cannot reserve parking spaces or restrict other people’s activities in the park nearby unless the activities are illegal. People enjoying the park in close proximity to your rental space. Please Note: The Rose Garden will be closed to visitors starting February 1st, for an estimated 4-6 weeks, for irigation repairs and maintenance work. We apologize for any inconvience this may cause, thank you for your understanding. More than 151 days’ written notice of cancellation will receive a 50% refund; 0 to 150 days’ notice = no refund. Additionally, no refunds are given due to weather conditions. We strongly encourage all rental guests to carpool and allow for plenty of time to find parking in the vicinity of the Point Defiance Pagoda and Rose Garden due to traffic revisions, fencing, and construction equipment now at Point Defiance Park under Destination Point Defiance. Destination Point Defiance is a long-term comprehensive planning initiative started years ago to enhance the park’s experience and honor its character. The capital improvement bond approved by voters in 2014 is funding much of the related construction work along with grants from the state RCO program, Washington State taxpayers, donors and other sources. Overall facility appearance and condition at Metro Parks Tacoma facilities may change between venue viewing and the day of the scheduled event.